Imagine this: It's a cold January day, and while at work you suddenly start feeling very sleepy. By 5:00 you notice your throat is sore, nose is running, head is pounding, and you're distracted by thoughts of being asleep at home. When I first feel a cold coming on, I immediately start my vitamin regimen, stick to broth soup, plenty of water, and before climbing into bed I make sure to do the wet sock treatment. I swear by this and know many others who do as well. You might be thinking, "Wet socks?! That doesn't sound comfortable at all!" But wait — it's not as bad as you think, and it's effective. Trust me. All you need are a pair of wool and cotton socks, and water. Then, let your body do the work. First, let me briefly explain why the wet socks help. 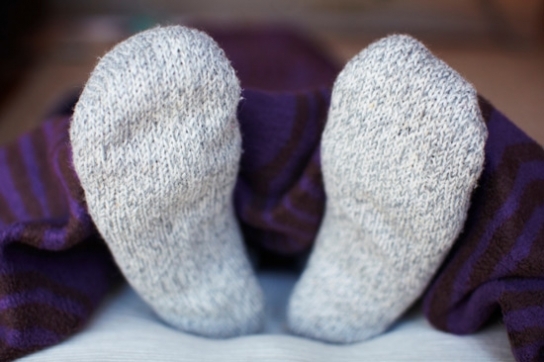 After putting on the socks, you'll climb into bed and drift off to sleep. While dreaming sweet dreams, your feet will be doing all the work. The vessels in your feet will constrict as your feet cool down, which sends all the good nutrients into your organs and tissues. These nutrients are needed to fight off infections and stimulate healing. Then your feet will start to warm up again, and your vessels will dilate to release the heat. This is when the junk in your tissues is dumped into your blood stream so that your body can dispose of it. The alternating of hot and cold creates a pumping mechanism that stimulates your circulation and lymphatics. The results are an active immune system and decreased congestion. By the morning, your socks will be completely dry. Have your kids try this hydrotherapy regimen too! 1. Just before bed, put your feet in hot water for 3 minutes. You can place them in the bath tub under running water. The water should be as hot as you can handle it without burning your skin. 3. Put on 1 pair of heavy wool socks over the ankles and climb into bed. 4. Cover well and sleep all night with socks on. Don't remove socks until they're dry. 5. Stay away from dairy and sugar, and drink plenty of water. Then notice how much more quickly you feel better when you use the wet sock treatment!